Castillo de Feliciana is a new winery that had its grand opening Fall Release Weekend. Originally envisioned as a “retirement project” for dentist Sam Castillo and his wife Deborah, the winery has quickly become all that and more. Named after Deborah’s grandmother Feliciana, Castillo de Feliciana boasts a beautiful tasting facility with the Blue Mountains serving as a backdrop. The winery design was inspired by the Andalucía region of Spain. The facility has an outdoor patio space, a beautiful indoor tasting area, and surrounding vineyards. The estate vineyard is seven and a half acres planted to Tempranillo, Merlot, Malbec, Cabernet Sauvignon, and Albariño. The first harvest is expected in 2011. About half of the wines produced in the future will be from estate fruit and half will be sourced from other vineyards. Ryan Raber, previously of Tertulia Cellars, serves as Castillo de Feliciana’s winemaker. The winery’s initial releases include a Sémillon, Viognier, Tempranillo, and Red Wine. Cabernet Sauvignon and Malbec will be added in the future. 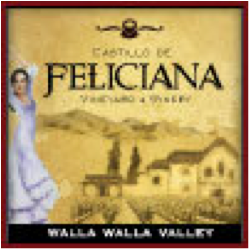 Castillo de Feliciana’s wines are currently in a sweet spot of well-made, well-priced wines. To wit, the Miercoles hails from Pepper Bridge Vineyard and costs less than $20. Castillo de Feliciana made 400 cases in their first vintage, 1,000 cases in 2008, and 2,000 in 2009 – about where they are looking to remain. Red wines sampled at 67 degrees. Rating: * (Excellent) A yeasty nose with aromas of pizza dough along with lemon streaks. Full and expressive on a lemon-filled palate. Shows a lot of depth and complexity on the taste. A lot of wine for the money. Fermented and aged in stainless steel. Rosebud Vineyard (Wahluke Slope). 14.5% alcohol. 57 cases produced. Sampled at 57 degrees. Rating: . (Decent) Very light in color. An unusual, almost eggy nose that also shows some fruit but seems to largely lack the variety. Fairly flat on a palate that wants some uplift. 81% Viognier, 19% Roussanne (Seven Hills West, Lonesome Spring Ranch vineyards). 12.1% alcohol. 184 cases produced. Sampled at 62 degrees. Rating: + (Good) Nose marked by a lot of red fruit, spice, and red vines. Tart on the palate with abundant red fruit. 100% Tempranillo. Rosebud Vineyard (Wahluke Slope). 14.4% alcohol. 121 cases produced.